After returning late Saturday night from our trip, there was much to do. We had a lot of dirty laundry, things purchased in Kampala to put away and a van that needed much cleaning. We were also pretty exhausted from our trip and from our colds. I briefly considered staying home from church to rest and recover, but I am so glad that I did not. We arrived a bit late since we had been talking with Stella. Elijah was playing the drums up front with some other boys. Since we arrived late it was soon time for prayer. The pastor noticed that there was a visitor and asked her to introduce herself. He also asked how they could pray for her. After she shared, we gathered around her and prayed for her and her little baby. A little later David shared that I would be going back to America this week. He asked for prayer for me and Ezra while we travel, for my tongue and for all of us while we are apart. They asked us to come up front, gathered around us, laid hands on us and all prayed in quiet voices in English, Luganda, Luo and another language that I can't remember the name of. Then one person prayed aloud for us all. It was very encouraging to see the way the church cared for our family even though we have only been a part of this congregation for about 2 months. The sermon was on Matthew 8:1-4. The preacher said he intended to preach a Christmas sermon, but the Spirit was leading him to this passage. This is a brief account of Jesus healing a man with leprosy. The two pastors spoke of our need for spiritual healing and cleansing and God's ability to also provide physical healing if it is in His will. It seems like God gave him this passage to encourage me and Stella. After the worship service, the elders met to discuss what they could do for Stella. They decided to go to where she is staying in a nearby village to investigate the situation more and see how they could help. So these two men spent their Sunday afternoon caring for a complete stranger. Stella has food for now and a place to stay, but they are going to follow up to help her connect with family who can help care for her and the baby. She is also going to receive a referral from GSF to take the baby to a local hospital to see what he needs. There are so many ways in which this congregation acted as the true body of Christ this Sunday. 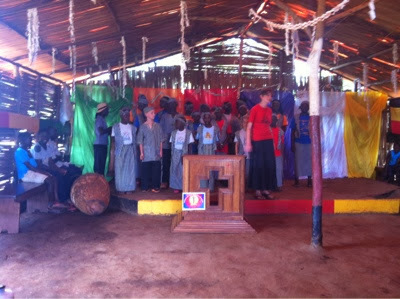 This small congregation in a rural village in Uganda is really shining their light. We are so thankful and blessed to be a part of this group of brothers and sisters in Christ! This photo is from the week that the Hosanna choir helped lead worship at Light of the World church. As you hold your candles in your Christmas Eve services, remember that the light of Jesus Christ is shining through the lives of his children all over the world. Merry Christmas!